How can we support the hunger strikers? 3/ Ask your union to send this information to all members and to consider submitting an emergency motion to the STUC conference. And ask your local Trades Council to contact affiliated unions and to organise a public meeting, and to consider sending a branch delegation to visit the hunger strikers in Strasbourg, as a show of solidarity. 4/ Ask your MP to sign this EDM, https://edm.parliament.uk/early-day-motion/52440/hunger-strike-by-leyla-g%C3%BCven-mp; to raise the issue of Ocalan’s illegal isolation publicly wherever possible; to demand that the Foreign Minister puts pressure on Turkey to comply with its obligations to end the isolation of Ocalan and to restart the peace talks; and to demand that the UK stops selling Turkey weapons. It is the Foreign Minister, Jeremy Hunt, who is the UK representative on the Council of Europe, so they should specifically ask him to get the European institutions to back their words with actions and make Turkey comply with their own constitution and European human rights conventions. 5/ You can also email the Foreign Secretary directly on fcocorrespondence@fco.gov.uk, with a copy to your MP. 7/ Ask your MSP to sign this Motion, http://www.parliament.scot/parliamentarybusiness/28877.aspx?SearchType=Advance&ReferenceNumbers=S5M-15432; to show public support for the hunger strikers’ call; and to ensure that no more Scottish Government money is given to firms that sell weapons to Turkey. 8/ Organise a public demonstration to raise awareness of the hunger strike. Share details of any events with us so we can publicise, and also share pictures so we can pass on to the Kurdish media. 10/ And if you are able to go to Strasbourg, or Newport, yourself, you can be sure that your visit will be hugely appreciated. Please contact us if you are planning a visit. The isolation of imprisoned Kurdish leader, Abdullah Ocalan is contrary to Turkey’s own constitution and to international human rights law. Ocalan’s ideas have inspired a major movement for grassroots, multi-ethnic secular democracy, and the respect in which he is held makes him key to a peaceful settlement for the Kurds in Turkey – an ideal for which he has strived repeatedly over the last two decades. Ocalan is in his 20th year of imprisonment by Turkey and is being denied access to his family and to his lawyers. Ocalan’s importance, together with the lack of international action, has forced the Kurds to take the desperate step of mass indefinite hunger strikes. MP Leyla Guven has been on hunger strike since 8 November. She has been joined by over 250 other political prisoners in Turkish jails and also by Kurdish activists around the world, including 14 at the seat of the European parliament in Strasbourg, and Imam Sis in the Kurdish Community Centre in Newport, Wales, who began their own hunger strike on 17 December. The Council of Europe, of which Turkey is a member, regards Isolation as a torture and a crime against humanity, but they need to act on their words. 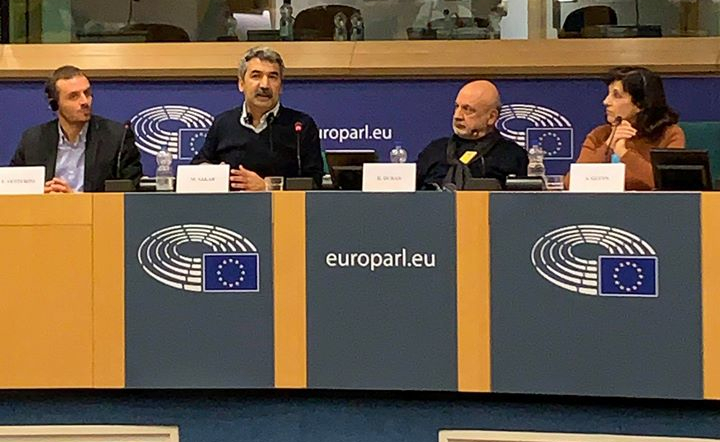 The European Court of Human Rights must take action against Turkey on many counts, and the European Committee for the Prevention of Torture must fulfil its role and visit Ocalan in prison. At the same time, the EU and UK must end their friendly engagement with Turkey, and European countries, including the UK, must stop selling Turkey weapons that will be used to suppress dissidents and minorities at home and attack Kurdish areas across the border. 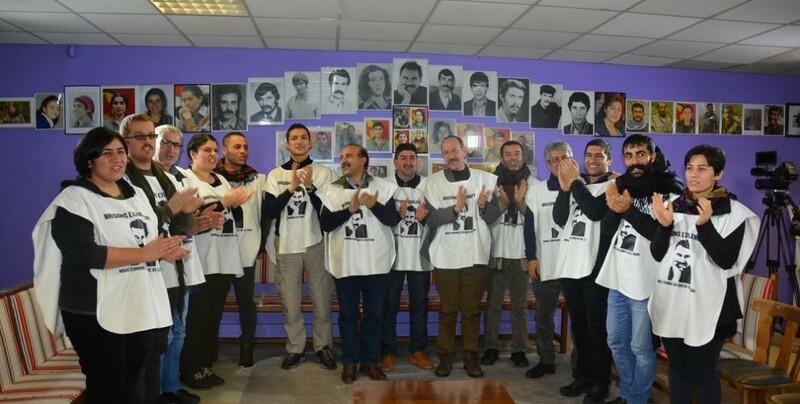 In response to the pressure of the hunger strike, the Turkish Government has allowed Ocalan’s brother a brief, ten-minute, visit – the first in 2 ½ years – and they have allowed Leyla Guven home on the 78th day of her strike. But the strikers are united in their determination that these token gestures are not enough and that they won’t be distracted from their fundamental and simple demand. Their bellies are empty, but their hearts are full. And the smiles – can we ever forget those smiles? What power is so strong that it can overthrow the most basic instinct for survival? How many must die for the world to take notice? What man can inspire such devotion? 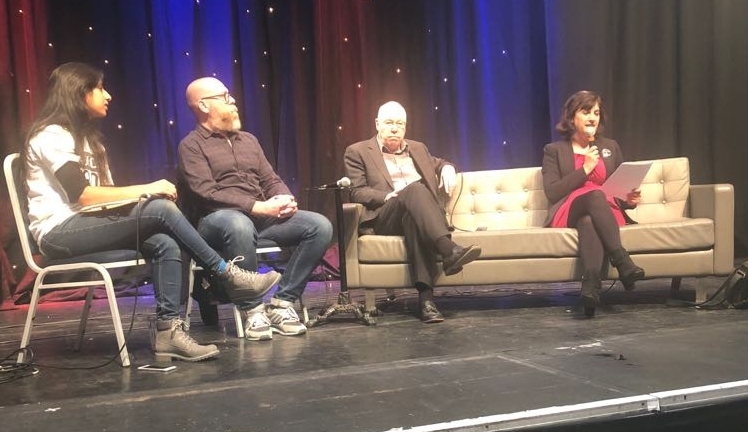 As we watch with horror the ease with which most of the world is prepared to abandon Syria’s Kurds to an uncertain and bloody fate, we can’t forget the part that is being played by the authorities here in Scotland. The UK Government has prioritised arms sales to Turkey, so it is perhaps unsurprising that the UK leads the resistance to ending the designation of the PKK as terrorists – as in the recent European Court action that found the grounds for the terrorist designation unsupportable. The PKK’s egalitarian philosophy and their history of resistance to the suppression of Kurdish culture has earned the organisation and its imprisoned leader, Abdullah Öcalan, the respect and support of Kurds across the world. Öcalan’s ideas have been fundamental to the grassroots revolution in Syria, and he has made many attempts to negotiate a peaceful settlement for the Kurds in Turkey. Any Turkish government that wanted to see a peaceful future would have to talk to him. We can imagine a time when a future UK prime minister might feel compelled to pay their respects at the scene of Öcalan’s incarceration in the same way as Theresa May has visited Robbin Island, but so long as the UK Government is in thrall to Turkey, active support for the PKK will be deemed illegal. And the UK terrorism Act gives the police wide powers to arrest on suspicion, even where there is no evidence of actual ‘terrorist’ activity. Much has been written about how the ‘Prevent’ legislation criminalises groups based on racial or religious profiling. 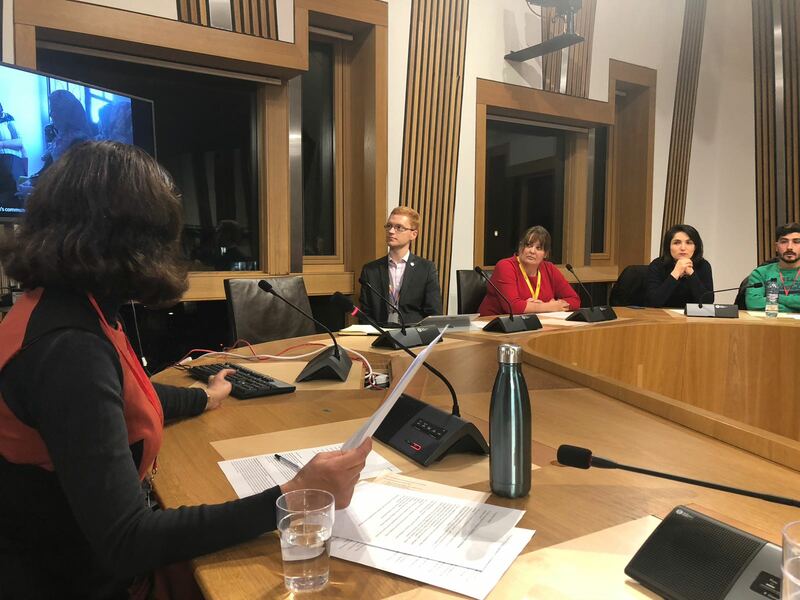 For the last three years this legislation has been used to arrest members of the Edinburgh Kurdish community – possibly at the instigation of the local Turkish Consulate. The community has suffered dawn raids and house searches. Flags in Kurdish colours, and other equally unthreatening items, have been taken away, and this year several men will have to appear in court. 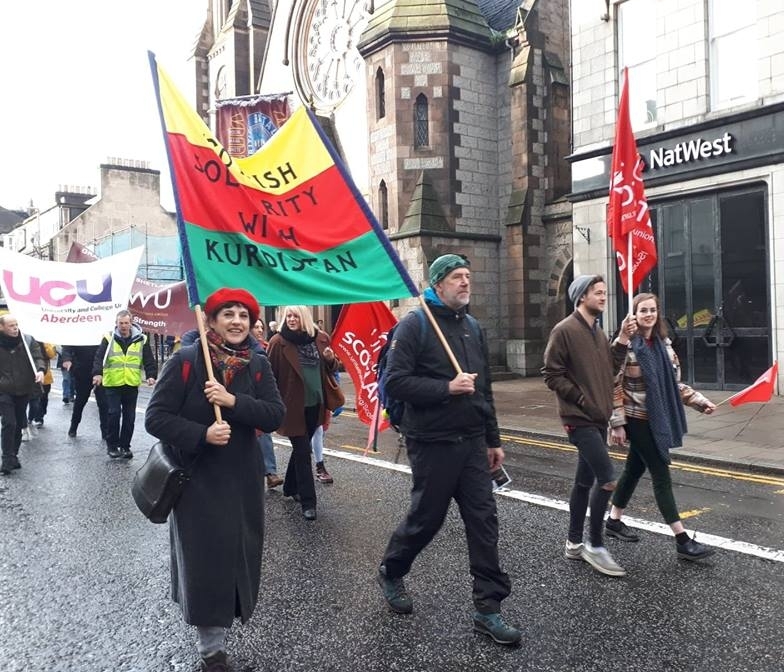 This targeting of the community makes it difficult for Scottish Kurds to express their political views at a time when their relations in Syria and Turkey are under attack. It even makes it difficult for them to express their Kurdish identity. 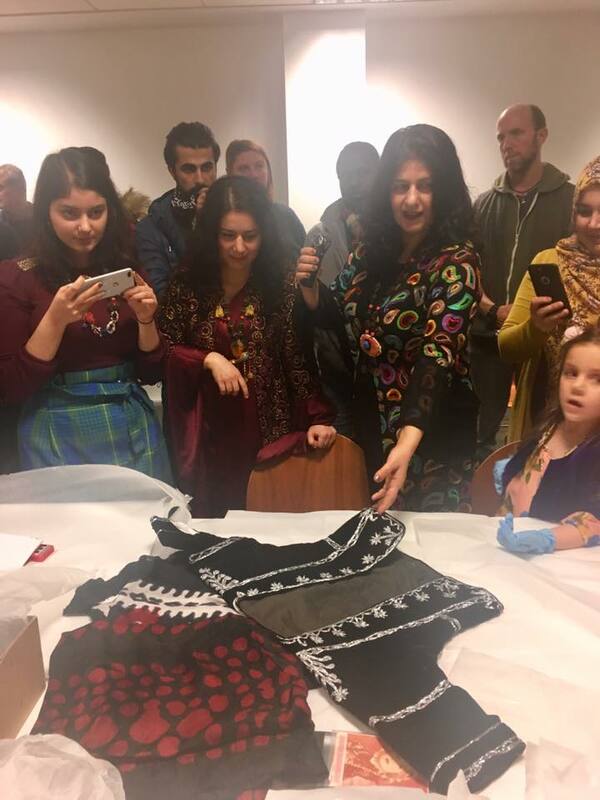 Most of these families have come to the UK because they were oppressed in their homelands if they identified as Kurdish. Now they are under similar constraints here. When Scotland’s Kurdish voices most need to be heard they are being silenced by Scottish police. Even when they speak they must self-censor. Talk about fighting Daesh – fine; talk about implementing Öcalan’s ideas of grassroots multicultural feminist democracy and you might tread on more dangerous territory. Welcome to 21st Century Britain. SSK’s last public meetings of 2018 were in solidarity with the community members who had been arrested. 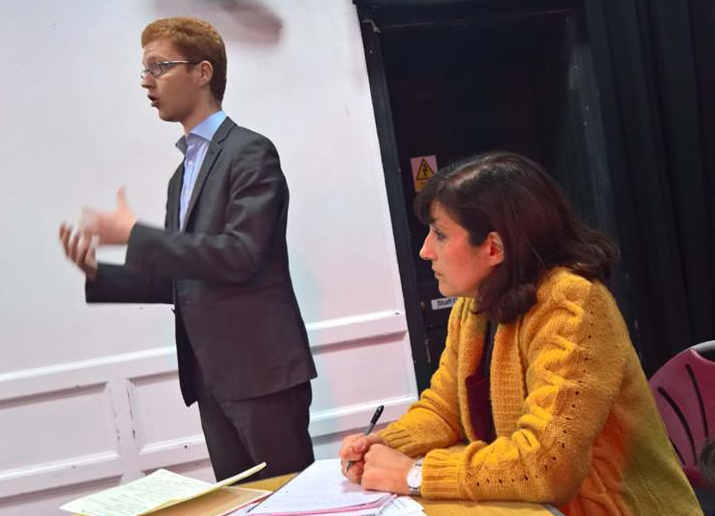 In Edinburgh we were joined by Ross Greer MSP who emphasised the need to support the community and to take up the issue of criminalisation of the community with the police and justice department. A representative from the community explained how the police actions have intimidated them, and especially affected the children and their ability to express their cultural identity, and Sarah Glynn described how Öcalan’s ideas, which these actions attempt to shut down, are being implemented in building a new progressive society in Northern Syria. The meeting supported the campaign for the PKK to be de-listed, and for this to be raised with MSPs. 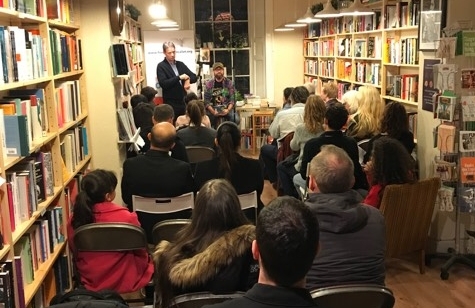 In Glasgow a packed room heard the writer James Kelman, a long-term supporter of the Kurds, as well as SSK’s Stephen Smellie and Roza Salih. 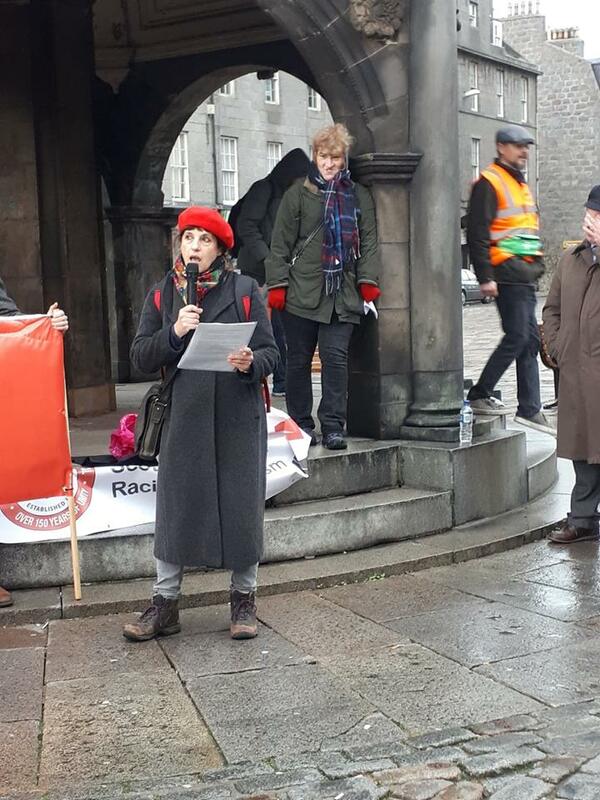 A unanimous message of support was also sent to the community from the Islamophobia conference jointly held by Scotland Against Criminalising Communities and the Islamic Human Rights Council on 15 December. 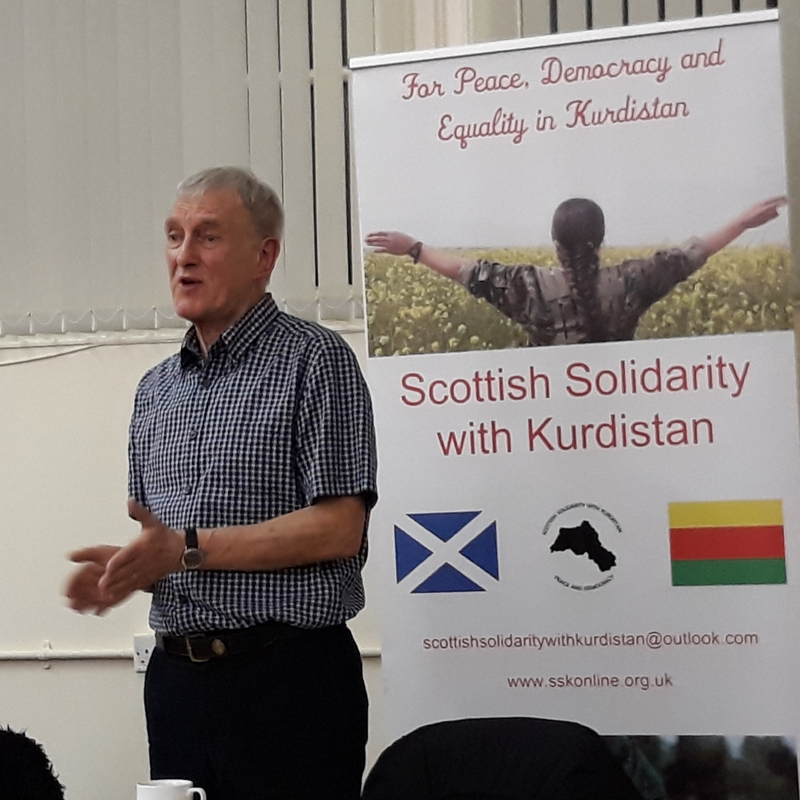 An article in the Morning Star quoted both the SSK and James Kelman, and we organised a long letter calling for a stop to this persecution of Kurds seeking sanctuary in Scotland that was signed by politicians and trade unionists, and published in the National. 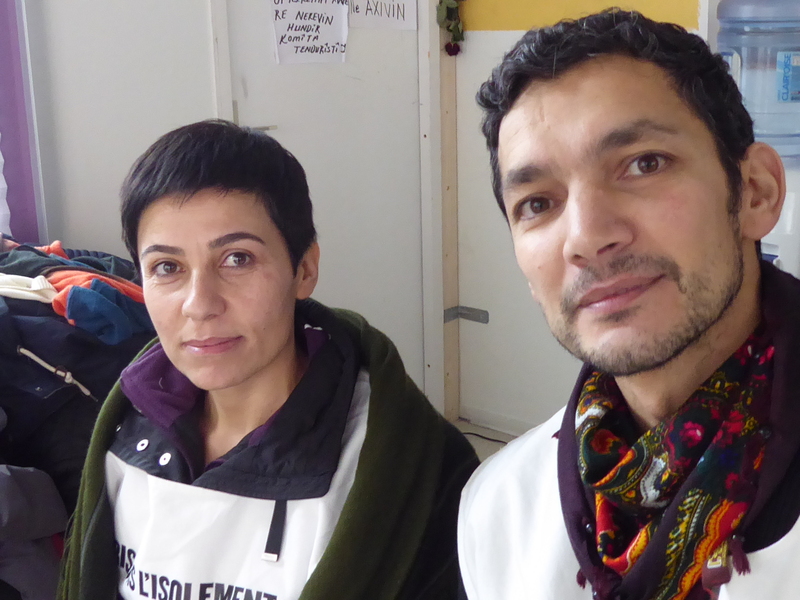 Sarah and Roza wrote to the National highlighting Erdoğan’s threat to the Democratic Federation of Northern Syria (even before Trump’s sudden announcement of US withdrawal); and we sent a message of solidarity to HDP MP Leyla Güven, who is in prison in Turkey and on hunger strike to call for an end to the isolation of Abdullah Öcalan. Over this last year, Kurdish achievements, in building an alternative society and beating back Daesh, have only been matched by the growing threat to their very existence by outside forces, and everyone must be concerned about what 2019 will bring. 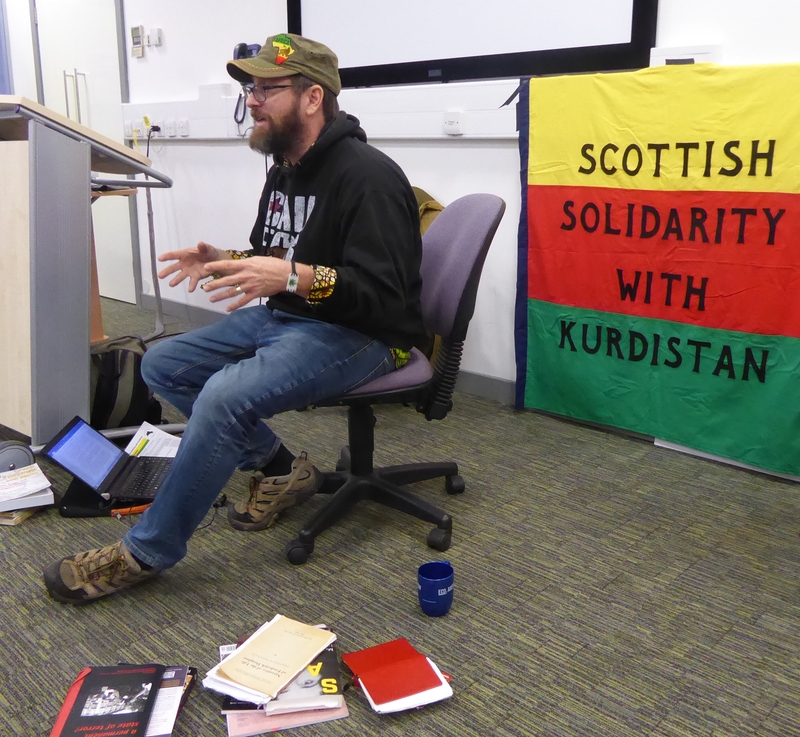 There are not many of us, but we will continue to try and ensure people in Scotland are aware of what is happening, and that we can show Scottish solidarity for Kurds under attack everywhere. 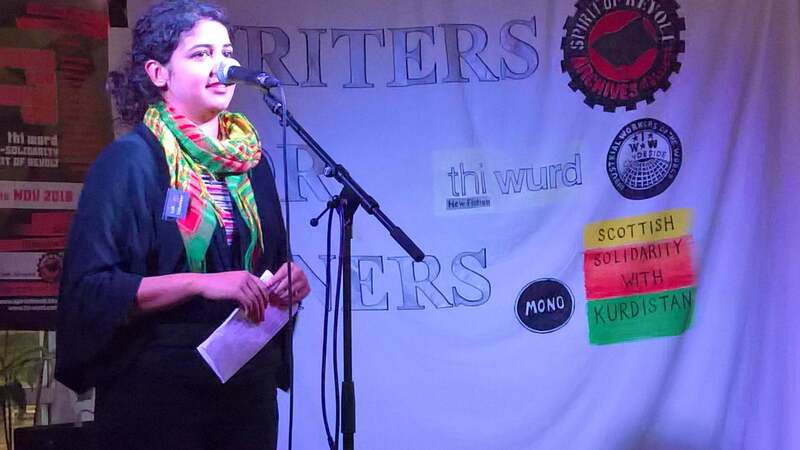 And on 28th November Roza spoke about solidarity with Kurdistan at the Writers for Miners event in Glasgow, whilst writers and singers recalled solidarity with the miners. Jeff is not your usual university lecturer. He is a Marxist, and he gladly admits that his interest in Öcalan, and the movement Öcalan has inspired, arose from a challenge by his student to go to Syria and see for himself. That student was Dilar Dirik whose articles and activism will be familiar to many Kurdish activists. 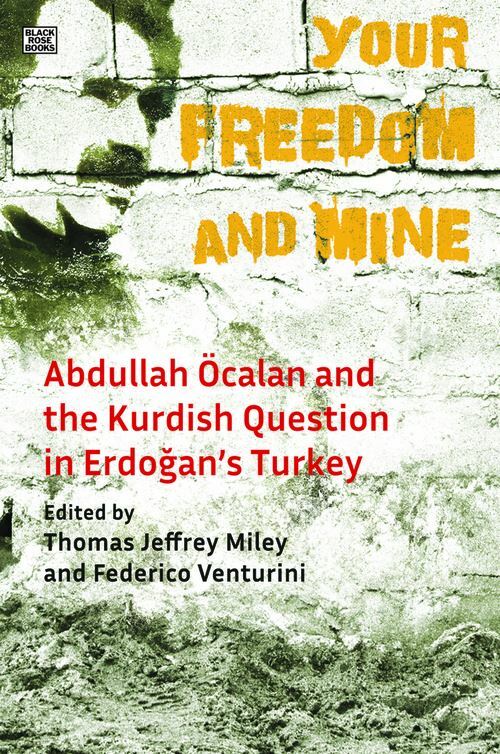 Four years on from that challenge, Jeff has edited a book, ‘Your Freedom and Mine: Abdullah Ocalan and the Kurdish Question in Erdogan’s Turkey’, and last week he was in Scotland to talk about it, addressing meetings in Edinburgh, Glasgow and Dundee. A central theme of his talk was the importance of this struggle for the wider world. Öcalan’s radical democracy, which transcends state borders and divisions, has provided us with a new articulation of anti-capitalism at this time of crisis, where our current system is driving us towards climate catastrophe, state terrorism and a resurgent far right. 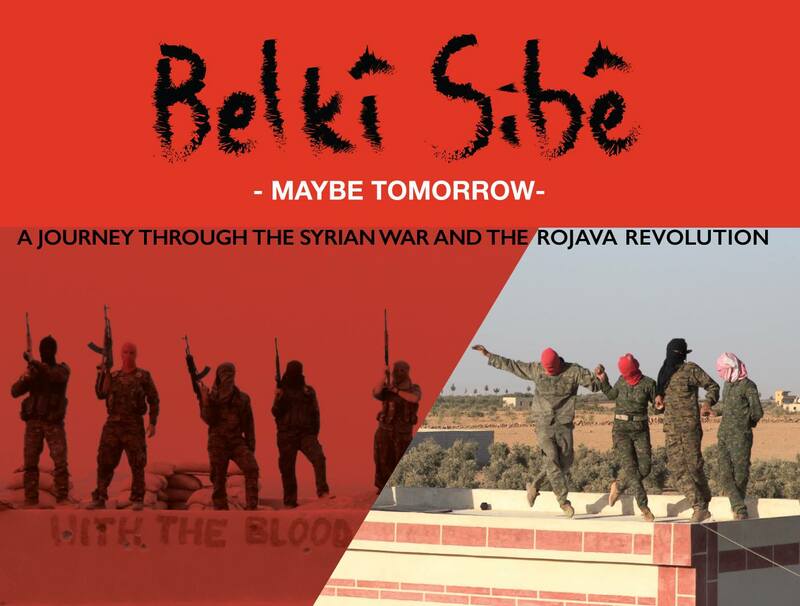 Solidarity is thus not ‘helping’ the Kurds, but learning from them and joining the struggle: understanding and spreading their manifesto for a democratic civilisation, and being inspired by their will to resist. He stressed that for these ideas to succeed they have to spread, and that revolution only in one country is destined to fail, and he pointed out how the involvement of people outwith the Kurdish community can help demonstrate the internationalism of the movement. This involvement can include action in Western countries against militarism and climate change; and, importantly, also action in less developed countries, where people are actively looking for an alternative to imperialism. Jeff has seen for himself the positive reception Öcalan’s transformatory vision in the ghettos of Nairobi, among people with nothing to lose but their chains. Please contact us if you are interested in a copy of the book. 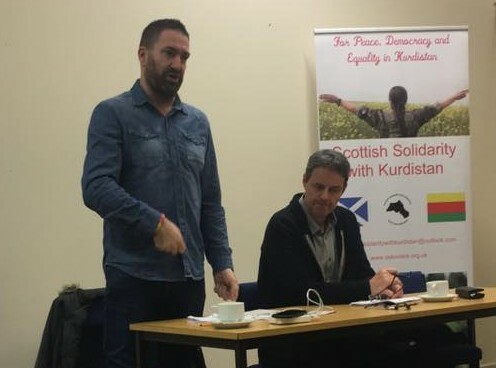 I am very happy to be here on behalf of Scottish Solidarity with Kurdistan, not only because the Kurds are an often unnoticed minority in Scotland, and not only because Kurds are suffering a brutal repression at the hands of a Turkish government that Theresa May calls her friends and sells British-made arms to. 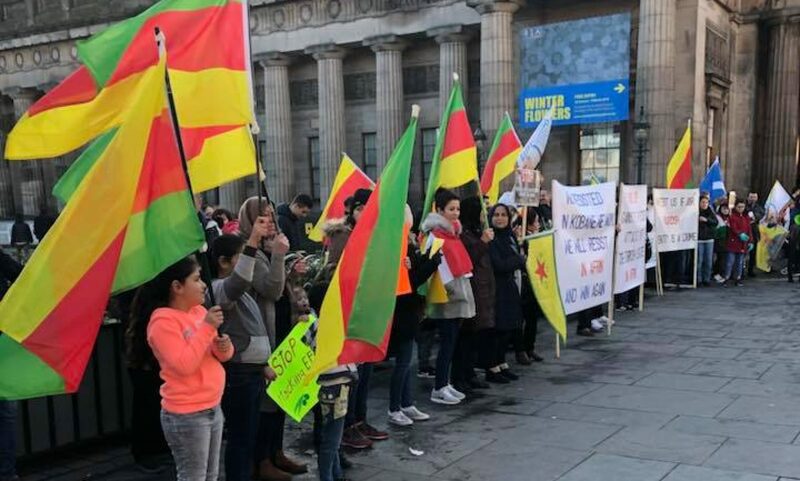 What makes me especially glad to speak about the Kurds on an antiracist demonstration, is the opportunity to talk about the achievements of the radical Kurdish movement, inspired by Abdullah Öcalan – including all they have done to break down ethnic barriers and cut through religious prejudices. In Turkey, in Northern Syria, and in the Qandil mountains of Iraq, the Kurds are striving to create an alternative system based on an inclusive bottom-up grassroots democracy. In a part of the world know for overwhelming patriarchy, their movement is actively feminist, pushing for women to take a full role in society and ensuring every organisation has male and female co-chairs. Theirs is a movement that values ecology and sees humanity as part of the natural world; and a movement that tries to ensure that all ethnic groups are able to practice their own culture and language and take full part in running society. When, at the beginning of the Syrian civil war, Assad’s authority was in retreat, the Kurds in Northern Syria were able to take advantage of the power vacuum to take autonomous control of the areas where they lived and to put their radical democratic system into practice. But almost as soon as this was established, they were attacked by ISIS. The Kurds’ successful fight back in Kobanê was the first time that ISIS suffered a major defeat. And the Kurds and their allies have gone on to liberate other areas from ISIS and to bring those areas into a democratic federation. Syria is ethnically very mixed and the newly liberated areas are home to a wide range of different peoples, with different languages, cultures and religions. In setting up new structures huge care has been taken to ensure that all minorities are represented. Although Öcalan started his political life fighting for a Kurdish state, this progressive Kurdish movement, which now turns its back on top-down state power, is only too alert to the dangers of any form of ethnic nationalism. They know that the majority group will always dominate the minorities – even a majority group that was once itself a minority. I was able to see this radical politics in action when I visited Northern Syria in May. One of the places we visited was Manbij, which the Kurds liberated from ISIS and which is made up of several ethnic groups. We visited Manbij Women’s Council and met Arabs, Turkmen and Circassians, as well as Kurds. Discussion was slow as remarks often had to be translated into two languages, but they told us how they were knocking on the doors of all the families in their neighbourhoods, both to help the women come out and take an active role in wider society, and to remind people of old bonds and mixing between different ethnic groups and of the importance of working together. Their approach provides an example of what is possible. But at the same time, every Middle Eastern and global power is intervening in Syria for their own selfish agenda, and these are often ready to play one ethnic group off against another for their own advantage. Turkey has systematically destroyed the Kurdish areas within their own borders, and invaded and overrun the Kurdish canton of Afrîn in Northern Syria, which had become a safe haven for refugees from across the region. Now Turkey is eyeing up Manbij and even Kobanê. And although the US and Europe are happy to support the Kurds in the fight against ISIS, they have no interest in supporting the Kurds’ radical project, or even in protecting the Kurds themselves. But the more that people across the world spread the word about what is happening, the harder it will be for our governments to continue to act with impunity. International solidarity is vital to protect both the Kurdish people and the revolutionary ideas that they have gifted to all of us. 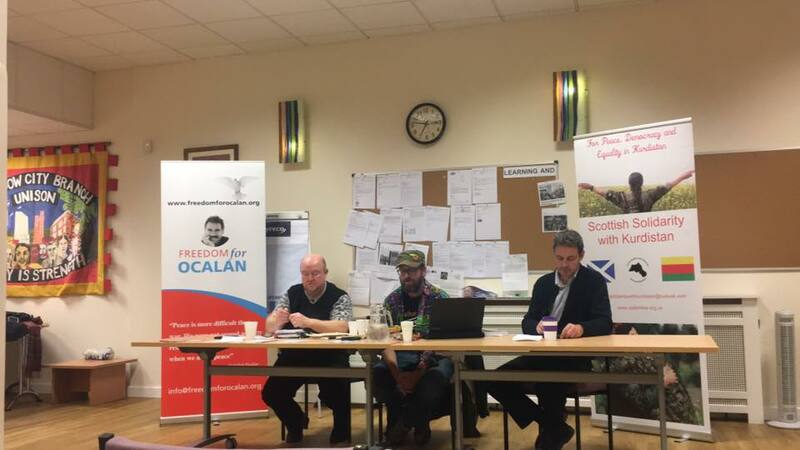 Steve Sweeney is foreign correspondent for the Morning Star, and when he spoke last Monday to a joint SSK/Morning Star public meeting in Glasgow about his experiences in Turkey, there were several moments when we realised how extra lucky we were to have him alive and well in front of us. Like when he described how he had realised that the man who had been fixing things for him and his colleagues was a member of the ultra-right MHP and had been planning to hand them over to ISIS. By that time they had already had guns pointed at them and just missed being deliberately run down by a car. Or when he told us about the occasion when security forces held them at gunpoint for eight hours in the heat without food or water, threatening to take them into the mountains to use for target practice. To add to their discomfort they had had to watch a stray dog being hosed down and fed – and before they were released Steve was made to pose with a gun, creating photographic ‘evidence’ for his file. But, as Steve stressed, he had at least been left free to report. Of all the world’s journalists who have been imprisoned, 1/3 are in Turkey, and the crackdown has only intensified. In one week, 84 journalists were put on trial. Around 10,000 journalists have been deprived of their press cards, and those still working survive through self-censorship, so it is hard for people in Turkey to get access to alternative views. The last remaining liberal newspaper was stormed by armed police a month ago, and its board sacked and replaced by government supporters. Of course the crackdown is not limited to journalists. After the failed coup, which President Erdoğan described as a ‘gift from God’, public sector workers, academics, activists and politicians have all lost jobs wholesale, with many under arrest for ‘terrorism’. Steve told us that he had made many attempts to attend the trial proceedings of the former HDP co-chair Figen Yuksekdag, but no observers have been allowed. Steve covered Turkey’s constitutional referendum, where they counted unstamped ballots, and critical outside observers were dismissed as ‘terrorists’. And he described covering the subsequent election, where in every polling station he visited in the Kurdish area of Van voters had to cast their ballot under the watchful eye of a soldier with a rifle. He told us, too, how he managed to interview the families of people who had been deliberately burnt alive in Cizre basements as the Turkish security forces besieged and flattened their city. Steve was scathing about the Tory government’s support for the Turkish government. He argued that the most effective way to help the people of Turkey is to bring down the Tory government here; but he also expressed disappointment at the lack of solidarity action from the Labour opposition. None of the international organisations have found it in their interest to restrain the Turkish government. The EU has handed Turkey billions of pounds in exchange for them keeping refugees out of Europe. Steve told how he had sent the UN video evidence of Turkey’s chemical attack on Afrin, but no-one came to investigate. UK government callousness extends to the treatment of those who have had to flee from Turkey. 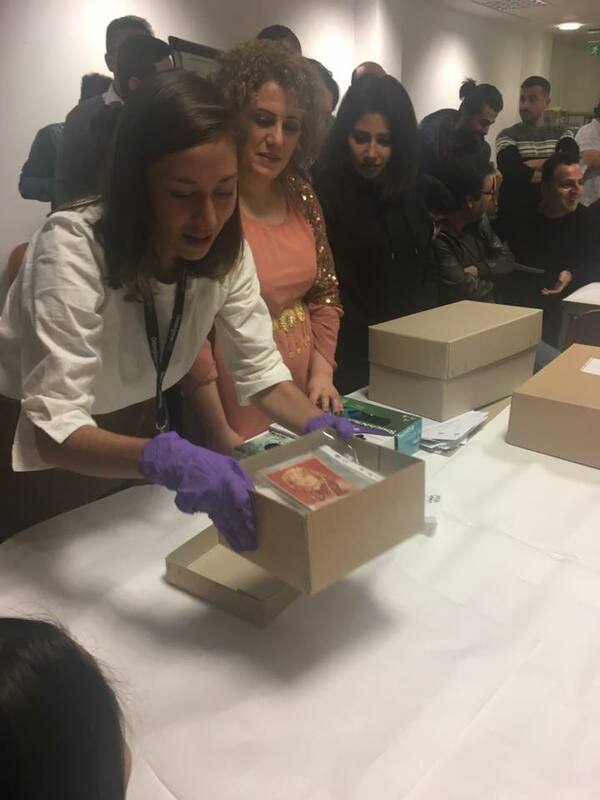 With Steve was a young Kurdish journalist who had been in the UK when the Turkish government cracked down on her whole politically active family and took away her passport. Now, as an asylum seeker, she gets almost no help and is not allowed to work. With journalists under such threats, the least we can do is make sure that every report is well publicised and read. 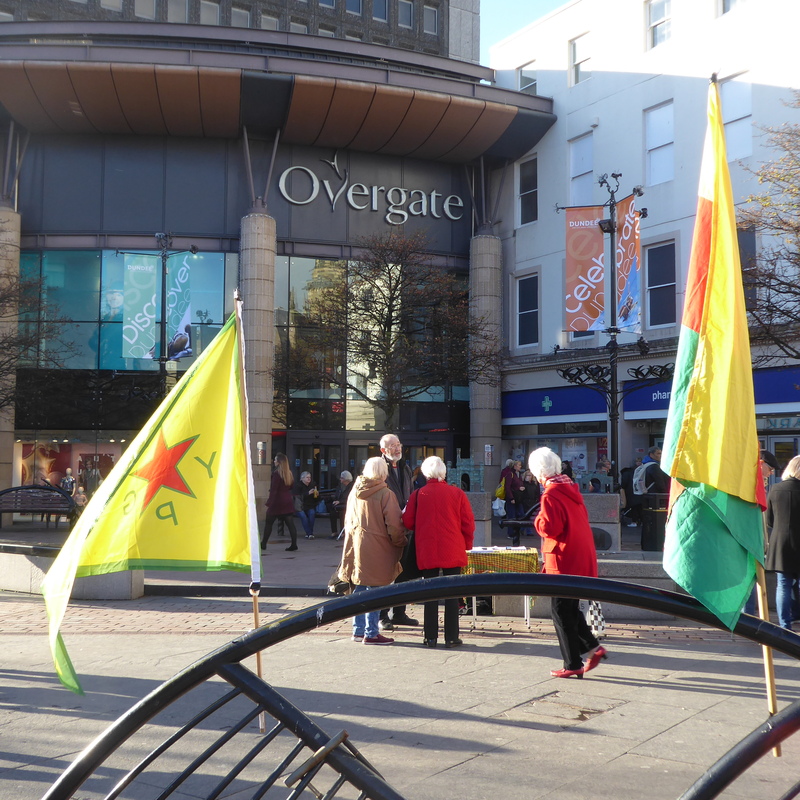 With Turkey again turning their guns on Rojava, and threatening further attacks, we marked Kobanê Day in Dundee with some emergency protest/solidarity action in the city centre. 4 years ago, the world watched in awe as the Kurds of Kobanê carried out a heroic defence of their city that was a turning point in the battle against ISIS. 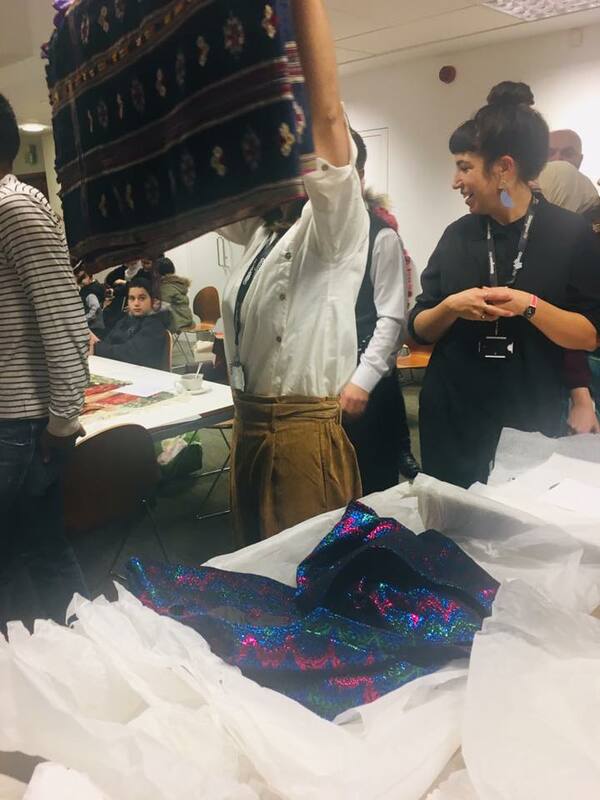 We also learnt about the alternative autonomous society they were creating in Northern Syria, based on grassroots democracy, feminism and secularism. In the midst of the barbarism of the Syrian civil war they were creating a model society that is a source of inspiration to us all. But none of the surrounding imperial powers want to see this succeed. Turkey has suppressed the Kurds within its borders for 100 years and dreams of a new Ottoman empire. In 2014 Turkey made it clear that they hoped and expected that Kobanê would fall. Earlier this year, we protested Turkey’s brutal invasion of the peaceful and predominantly Kurdish region of Afrîn. Most of the Kurds of Afrîn are now refugees, while Jihadi gangs occupy their homes and terrorise the remaining population. November 1 is Kobanê Day when the world remembers the city’s stand against ISIS. But now, even as Kurdish soldiers are still battling the remnants of ISIS further south, Turkey has announced plans for taking their invasion of the Kurdish areas of Syria further, and they have turned their guns on villages in the Kobanê region. The Kurds have had to call a temporary halt to their action against ISIS to defend their homes and the peaceful and inspiring democracy that they have built. Turkey was able to take Afrîn because the world stood aside. The UK government continues to call the increasingly fascistic Turkish government their friends and to sell them arms. So far, the attacks on the Kobanê region have been limited, but that is how the invasion of Afrîn started too. We need to make it clear that any attack is unacceptable. Please join us in showing solidarity to the people of Kobanê and in calling on the UK government to end its support for Turkey. Find out what is happening, (check out check out anfenglishmobile.com and theregion.org), write to your MP, and join us in Scottish Solidarity with Kurdistan. Alexis Daloumis is a Greek filmmaker and an Anarchist and fought as a volunteer with the YPG in Manbij and Raqqa. And last Friday he told SSK Dundee about his plans for making a documentary with the material he gathered while there. Wearing a camera while fighting must add yet another layer of difficulty, but it certainly allows those who watch the resulting film to get a sense of what it would be like to be there. Other clips show the volunteers’ daily life – and death, in the form of a martyr’s burial. Alexis has lots more material, including interviews, and is currently touring round the UK to raise funds for editing and translation. 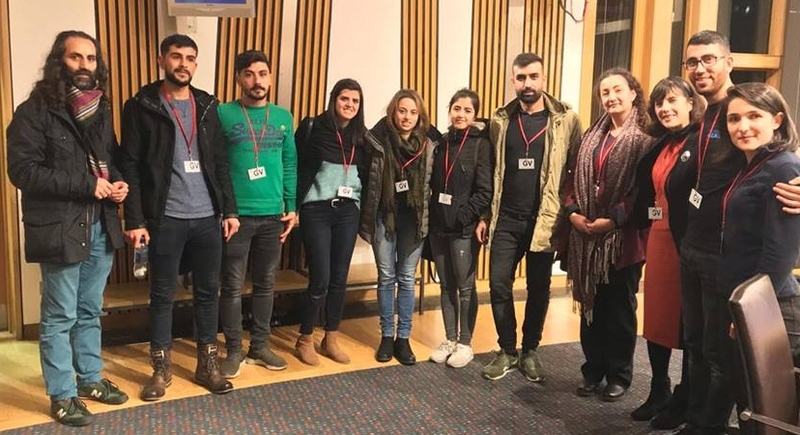 The Dundee meeting was arranged at a day’s notice and the audience was mostly students – not so good for fund raising, but excellent to discover new young people interested in what is happening in Northern Syria. We will share the fundraising page and film preview as soon as it becomes available.